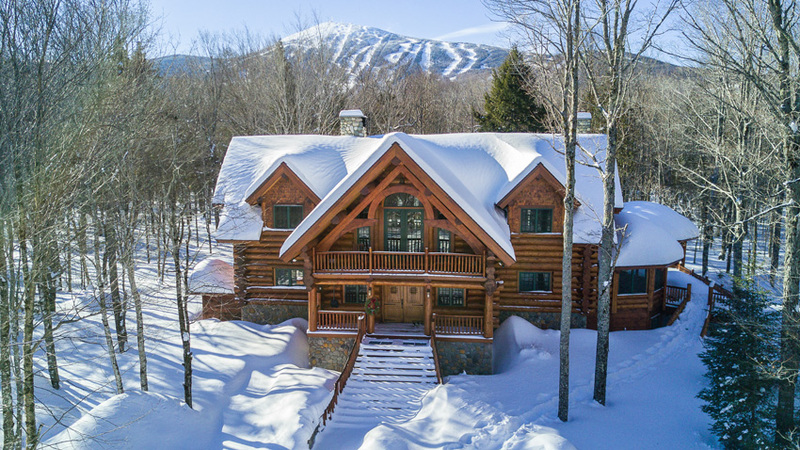 A grand, handcrafted log cabin at the base of Sugarloaf Mountain is custom-made for exhilarating winter getaways and big gatherings. Skiing mecca Sugarloaf is probably as renowned for its bustling social scene, family-friendly vibe, and tightly knit community of dedicated “Loafers” as it is for its world-class slopes. After hours spent kicking up fresh powder, folks here gather for cocktails and meals, basking in the glow of a fire — and the blissful exhaustion fresh air and exercise ushers in. In 2004, a doctor from Waterville built the 7,500-square-foot Fireside Lodge to host the kind of slopeside get-togethers he treasured. Nestled in a grove of pine, fir, and aspen trees on a private street off the Sugarloaf Access Road, the five-bedroom, four-bath retreat can accommodate a passel of loved ones. The kitchen, fit out with stainless-steel appliances, opens into a sweeping great room with cathedral ceilings and a prodigious fireplace — one of seven in the house — hewn of intricately laid granite and Corinthian fieldstone. Floor-to-peak windows on the west side invite light and the forest in, and offer glimpses of cobalt sky and the snowy crest towering in the distance. Outside, a vast deck immerses you in the wooded setting. With its log walls and framing, live-edge wood tables and countertops, and amenities including a sauna, hot tub, ski-tuning room, Ping-Pong table, and radiant heating, the home has the feeling of a luxury ski lodge, as well as the convenience. Drive 5 minutes to the slopes or pick up a shuttle at the end of the driveway. Garth Farquhar, owner of Tobique Log Homes, designed and built the lodge in New Brunswick, using spruce logs harvested from 100-foot-tall trees. Each log was peeled of its bark with drawknives, then scribed and notched with chainsaws and axes, a process that preserves the natural taper and nuanced undulations of each piece. Farquhar then disassembled the structure, numbering each log, and trucked it to Sugarloaf for reassembly.